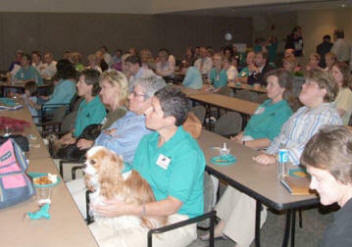 Since 1996, Hand-In-Paw has provided registered Delta Society teams of handlers and pets to serve as therapeutic tools in medical, social service, and education settings for children and youth. HIP volunteer teams have made over 100,000 beneficial contact visits through community events and in a number of participating facilities. HIP also serves as a resource for students and for therapists who want to utilize animals in their practice. 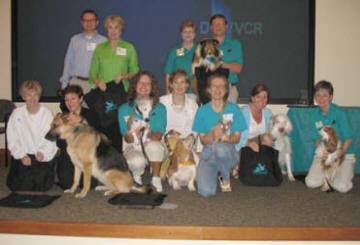 Most of Hand-in-Paw's services and programs focus on children and youth. HIP provides programs for children and youth at risk using a specific curriculum to teach positive life skills and modify behavior. In health care facilities, HIP works with staff to provide emotional and physical rehabilitation with specific goal-oriented interactions between patients and therapy animals. HIP offers a literacy program, Sit, Stay, Read! in partnership with local libraries to assist reluctant elementary aged readers in improving their reading skills. 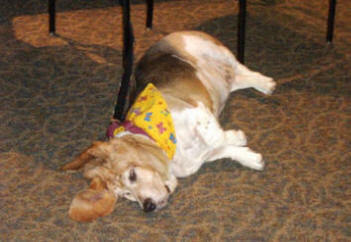 Over 60% of HIP therapy animals (dogs, cats and rabbits) are from a shelter or rescue situation. To find a great companion animal, visit your local humane society, animal control or rescue group. In demonstrating that these "throwaways" are skilled "healers", the value of these animals is elevated. 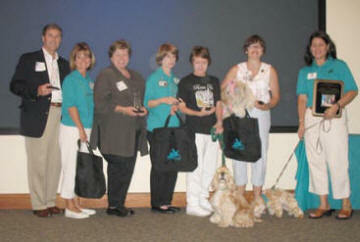 "My work with therapy animals has taught me to look past "disabilities" and focus on possibilities." 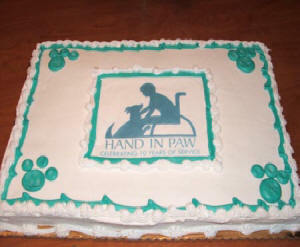 Hand-In-Paw is a 501 (c)(3) non-profit organization funded solely by donations and fundraising efforts. Your tax-deductible donations help us continue this vital work. We are counting on your support.